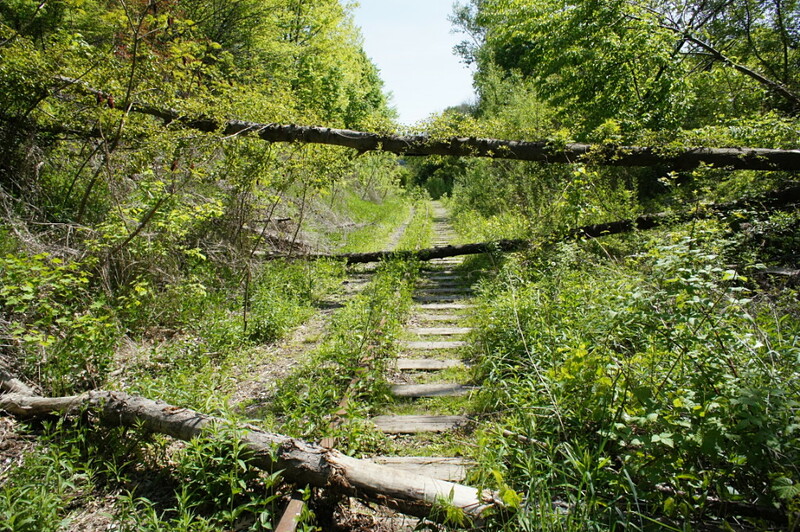 This abandoned rail line is slowly being reclaimed by nature. Surprisingly, it’s not part of one of the rail trails that I rode this summer, nor is it in the middle of nowhere: it’s barely a ten-minute bike ride from downtown Toronto. It’s owned by Metrolinx and it would be a very long shot to have a trail (with or without passenger rail) along here someday. I’m guessing east end somewhere? This looks like the spur in the Don Valley that connects to the CPR lines at Millwood Road. If I am correct, its disposition is that the provincial government is keeping it for a possible commuter link to Peterborough. So where is it ? It’s not like we’re going to over use it or anything. Sorry everyone, it wasn’t intended to be a secret, I just forgot to include the Google Maps link. I’ve added it to the article. It’s the same railway that crosses the Don Valley beside the Brickworks on the so-called half-mile bridge and crosses old Pottery Road. I’d love to see both a GO line to Peterborough and a trail along this route. The Metrolinx report (PDF) on the link to Peterborough says that they’d need to completely re-deck the bridge. That shouldn’t be as bad as putting up a whole new bridge and I’d like to see them add trail infrastructure between the Lower Don trail and Leaside at the same time. That’s if, of course, they ever actually follow through on this plan. My confidence in Metrolinx isn’t high.